September is National Preparedness Month (NPM) when Americans are encouraged to take action to prepare ~ now and throughout the year ~ for the types of emergencies that could affect us where we live, work, and visit. Use the month to focus on your preparedness efforts for various disasters and emergencies, and encourage others to get prepared too. Ready‘s 2018 NPM social media toolkit provides graphics, hashtags, and content that can be customized to your needs. In addition to the theme for the month, each weekly theme highlights different preparedness actions. Also consider getting our disaster preparedness and first aid manuals for your family, co-workers, customers, neighbors, events and training sessions for only $4.50 U.S. each delivered (70% off $14.99 list) on 10 copies & up and we can customize them for free! The 266-page paperback provides quick-reference instructional bullets in 2-color format with tips on what people should think about and do before, during and after specific types of emergencies and disasters (e.g. hurricanes, hazardous material spills, nuclear incidents, active shooter scenarios, etc. ), as well as how to administer basic first aid. Fedhealth can ship red books within 24 hours of your order … plus we donate a portion of bulk book orders to the U.S. First Responders Association in support of our nation’s first responders and veterans. Learn how to order “IT’S A DISASTER!” books (and download a free 56-page portion of it in PDF) or get our 280-page ebook in PDF for $3 U.S. at www.fedhealth.net/how-to-order.html … or call Fedhealth at 520-907-2153. September is National Preparedness Month (NPM) when Americans are encouraged to take action to prepare, now and throughout the year, for the types of emergencies that could affect us where we live, work, and visit. The Ready Campaign recently released the 2017 NPM theme “Disasters Don’t Plan Ahead. You Can.” and toolkit, which includes graphics, hashtags, and social media content to help spread the word to others. Week 1: September 1-9 – Make a Plan for Yourself, Family and Friends. Week 2: September 10-16 – Plan to Help Your Neighbor and Community. Week 3: September 17-23 – Practice and Build Out Your Plans. Week 4: September 24-30 – Get Involved! Be a Part of Something Larger. Learn more about National Preparedness Month at www.ready.gov/september. Also consider getting our disaster preparedness and first aid manuals for your family, co-workers, customers, church members, neighbors, events and training sessions for only $4.50 U.S. each delivered (70% off $14.99 list) on 10 copies & up and we can customize them for free! Fedhealth can ship red books within 24 hours of your order … plus we (Bill & Janet Liebsch) will donate a portion of bulk book orders to the U.S. First Responders Association in support of our nation’s first responders and veterans. September is recognized as National Preparedness Month (NPM) which serves as a reminder that we all must take action to prepare, now and throughout the year, for the types of emergencies that could affect us where we live, work, and also where we visit. Due to the success of last year’s theme, the Ready Campaign has decided “Don’t Wait, Communicate. Make Your Emergency Plan Today” will be returning for 2016 NPM. Making a family emergency communication plan is a great way to prepare for disasters, but testing your plan is even better so you’ll be familiar with how to respond. It’s also one of the 10 Ways to Participate in America’s PrepareAthon! National PrepareAthon! Day culminates NPM on September 30, 2016. 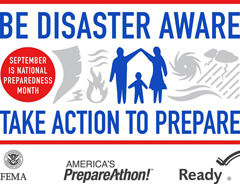 Individuals, families, organizations and businesses are encouraged to use America’s PrepareAthon! materials as you plan, host and support events, drills and training sessions throughout the month and on 9/30. Learn more about National Preparedness Month and find Ready’s NPM toolkit, graphics and more at www.ready.gov/september. September is National Preparedness Month (NPM or #NatlPrep) and we – along with thousands of private, public and nonprofit organizations – are encouraging Americans to take time to help your community get better prepared for disasters and emergencies of all kinds. NPM wraps up with America’s PrepareAthon! as a national day of action (on 9/30 or anytime) when individuals, families, organizations and businesses have preparedness events, drills and training sessions to help turn “knowing into doing”. A really fun way to get involved with NPM is to participate in the 30 Days, 30 Ways disaster preparedness game. #30Days30Ways was started by the Clark Regional Emergency Services Agency (CRESA) in WA with the goal of challenging people to do one basic task per day to enhance their personal readiness for emergencies. Each September, CRESA posts one simple readiness task each day and winners are selected from among the participants. The tasks are creative, fun and educational using an interactive social media based approach to reach an audience who may not be normally reached through traditional community events. A daily task will be posted by 7am PDT to 30Days30ways website every day during September. You can complete any task, any time as long as they are submitted by midnight on Sept 30th. You may enter as often as you like. This Year there will be 4 Weekly Challenges posted each Monday. You have until the following Sunday evening at Midnight Pacific Time to submit your entry. These Bonus Challenges will judged by a team of Emergency Management Coordinators at CRESA for creativity, relativity to the topic, popularity and how best it answers the overall theme of the game. Learn more about the 30 Days, 30 Ways Preparedness Challenge at www.30days30ways.com or follow them on Facebook or Twitter @30days_30ways or #30days30ways. For over a dozen years we have discounted our disaster preparedness and first aid manual up to 75% off the $14.99 list (or $3.50 U.S. each + freight) for agencies, nonprofits, volunteers, schools and others, but unfortunately rising costs have been piling up the past few years. Freight costs for ground shipments typically average about 50 cents per book plus there are handling charges and other fees we’ve absorbed for groups over the years. As of July 2015 our 266-page IT’S A DISASTER! paperback (either standard red books or custom printed ones in bulk) will be $4.50 U.S. each delivered* (70% off list on 10 copies & up). We still provide FREE customization ~ either with peel & stick labels on our standard red books … or … you can personalize covers and first 12 full color glossy pages in the print process on 1,000 units and up. And if you want to upgrade your order to add 48 to 288 extra full color glossy pages (up to 300 custom pages in front / back), the upgrade price is $7.00 U.S. each delivered*. * = Note: Delivered price in continental U.S.
And as before, custom CDs and flash drives are unique ways to distribute this life-saving data using our 280-page ebook and pricing depends on quantity needed and size of media needed. HOWEVER… since September is National Preparedness Month and 9/30 is America’s PrepareAthon, we plan to honor the lower $3.50 + freight price for our 266-page book (either standard red books [10 copies & up] or custom books [1,000 units & up]) … or $5.50 delivered price for larger, upgraded custom versions through October 2015. Basically all you need to do is ask for the old price and we’ll give it you! Books make great educational giveaways for employees, volunteers, members, customers and local communities, and our customizable tool can help clear out leftover grant dollars that are time sensitive. Also … groups needing smaller quantities can always purchase our standard red books and personalize them with free peel & stick labels. We can ship red books and custom labels within 24 hours of your order anytime so you don’t have to wait for a custom print. Also feel free to download a free mini ebook portion of our IT’S A DISASTER! book and scroll down or call Fedhealth at 1-888-999-4325 (in U.S. or Canada) to learn more. Keep in mind a creative way to raise funds for groups and get preparedness data out to local communities is to partner up with local Chambers, Rotary Clubs, Jaycees or others and sell ads inside books. Encourage businesses to include discounts or freebies on products and services to help incentivize the public and save them money on supplies and daily needs like groceries, dry cleaning, car repairs, lawn care and more! Total funds leftover for project = $152,500 … and more funds could be raised by collecting more per ad, offering premium placement on covers, etc. And share funds with your Chamber or Rotary partners so everyone benefits! Note: A $750 ad is only 15 cents per book that goes into 5,000 homes. And, if you do above example between now and Oct 2015, you could get the old $5.50 delivered book price mentioned above and save $2,500! Learn more about these funding ideas … and, if you know an agency, nonprofit, school, church, Scout troop, or volunteer group who could benefit from our preparedness book and/or funding ideas, please have them visit www.fedhealth.net or call Fedhealth at 1-888-999-4325 for more information. In honor of National Preparedness Month, we wanted to share some Fedhealth specials and ideas in case they can help with your public education campaigns and efforts during NPM and throughout the year. 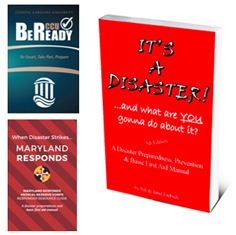 Our disaster preparedness and first aid manuals make great gifts for employees, volunteers, family members, friends and communities, and books can be customized for free to include logos and special messages to recipients. Plus we will donate 10% to 30% of orders back to our partners and others helping spread the word. Learn more or call Fedhealth at 1-888-999-4325 (US or Canada). Many times agencies and volunteer groups want to purchase IT’S A DISASTER! books for local volunteers and citizens, but they don’t have any money in their limited budgets. Plus nonprofits, schools and First Responders are always looking for ways to raise money. So ~ a creative way to get local businesses involved is to sell advertisements or acknowledge sponsorship inside books (or eBooks) … and Fedhealth will print the ads and other data for FREE and throw the value in as “match” on your paperwork. Groups can collect anything you can for ads or sponsorship … take cash, lines of credit, barter or trade (whatever you can get) … and keep it all since Fedhealth prints them for free..! It’s a whole community approach to resilience and preparedness. Learn more about our collaborative Public-Private Partnership ideas. Many Federal grants close out September 30th so if your agency or nonprofit has dollars that need to be spent before a certain deadline, please consider using customizable IT’S A DISASTER! books to commit those funds. Our book qualifies as community education on grants providing almost a $4-to-$1 return on match. Learn more or call Fedhealth at 1-888-999-4325. Read about some more creative ideas and activities for National Preparedness Month and please share these resources with others. September is National Preparedness Month (NPM or #NatlPrep) and we – along with a coalition of thousands of private, public and nonprofit organizations – are encouraging businesses, groups, schools and families to take time to help your community get better prepared for disasters and emergencies of all kinds. Below are some creative projects and ideas that other organizations are doing (or have done) in case these could benefit your preparedness campaigns. A key goal is to come up with fun and educational ways to get kids and adults involved..! During National Preparedness Month FEMA and Ready organizers are asking Americans to take action by planning a National PrepareAthon! Day on or around September 30th. America’s PrepareAthon! encourages millions of people to focus on simple, specific activities like hazard-specific drills, group discussions, and exercises that will increase preparedness. Join the America’s PrepareAthon! campaign and register to participate in the September 30 national day of action. Once you register you have access to guides, social media tools, and customizable materials you can use during drills or exercises on 9/30 and year-round. The key is turning knowing into doing! This is the 5th year of the 30 Days, 30 Ways Preparedness Challenge, in honor of National Preparedness Month. This game has grown exponentially over 4 years with over 10,000 preparedness tasks being completed. In the past, CRESA have relied on community donated prizes which have come in all shapes & sizes. This year, organizers want to reward players with $10-25 Amazon Gift Cards which are easier to share across the globe and don’t require shipping costs to their agency. And if you missed their past few contests, check out APHA’s Get Ready Cat Preparedness Photo Contest and Pup-Preparedness Photo Contest. The Emergency Kit Cook-Off challenges you to find creative use for the three day’s worth of food and potable water that you squirreled away for the family in case of an emergency. The Emergency Kit Cook-Off offers the public two ways to participate—1) vote on ingredients and 2) submit a recipe. Another way to support your community is to join a local Citizen Corps , CERT or Medical Reserve Corps … or call your city or county Emergency Management, Fire, Police, Health or Sheriff Department and ask about volunteer opportunities. Or talk to your local Salvation Army or Red Cross office … and get involved! Learn more about National Preparedness Month at www.ready.gov/september and encourage your families, friends, co-workers and communities to take action to prepare!